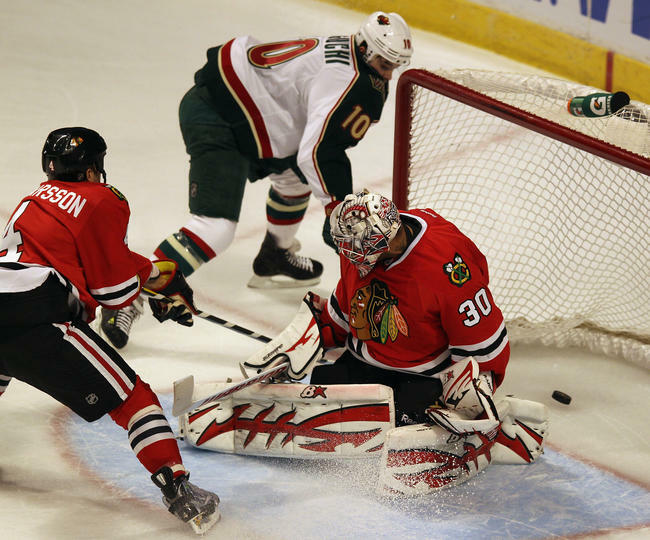 The Chicago Blackhawks fall in their regular-season home finale to the Minnesota Wild by a final score of 5-4 in a shootout. It was an interesting start to the hockey game (if you want to call it that) to say the least. There were a combined 36 penalty minutes in the first 6:43 into the contest. Jimmy Hayes and Brandon Bollig each dropped the gloves with a Wild opponent, while Andrew Shaw was handed a 10-minute unsportsmanlike conduct penalty after chirping with Darrell Powe prior to an offensive zone faceoff. Minnesota struck first midway through the first period. Devin Setoguchi slipped by a couple defenders and whacked in his initial shot that trickled past Ray Emery, but that lead only lasted for 34 seconds when Patrick Sharp answered back with his 33rd goal of the season. Just over 3 minutes later, the Wild capitalized on a power play after Dany Heatley found himself right on the doorstep and buried home his 22nd of the season that gave Minnesota a 2-1 lead. Early on in the second period, Brent Seabrook fed Viktor Stalberg beautifully who was cutting hard to the net and knocked in his 21st goal of the year, but the Wild quickly answered back once again with a pair goals within 41 seconds of each other extended Minnesota’s lead to 2 goals. Patrick Kane got one back, however, wristing one past Josh Harding set up nicely from Marian Hossa that kept the game within arms reach. Andrew Shaw and Cody Almond scrapped minutes later as Shaw tried to fire up the United Center crowd after momentum started to favor their side. It was a quiet third period until the last several minutes when Patrick Kane net his 2nd goal of the game on a nice feed from Andrew Shaw on the power play that tied the game at 4 and sent the game into overtime. 65 minutes wasn’t enough to decide a winner, therefore, it came down to a shootout in which Minnesota won in round 3. In his first start in weeks, Ray Emery stopped 26 of 30 shots, but just 1 of 3 in the shootout. With 2 games remaining in the regular-season, Chicago sits in 6th place and is now tied with Nashville with 98 points. The Blackhawks trail their divisional rival Red Wings by just a point for the #4 seed in the Western Conference. After 3 days of rest, the Blackhawks get back in action on Thursday night against this same Wild team, but this time in Minnesota; puck drop at 7:00pm CT! *Duncan Keith returns after serving his 5-game suspension for an illegal elbow on Canucks forward Daniel Sedin. ← A Little Knee Bending for Bears Offensive Line? And Other Points of View.